The staff at the MSU Sailing Center strives to provide a safe, supportive and welcoming learning environment for all participants. We offer scheduled, customized and private instructional and recreational programs for all ages in sailing, boating, paddle sports, safety and experiential youth programs. The Sailing Center promotes student development by engaging MSU student staff in instructional and recreational programs offered by the MSU Sailing Center. This engaging arrangement allows student staff the opportunity to experience MSU Division of Student Affairs & Services core values such as personal identity & community, social responsibility, leadership & intercultural competency, health & wellness, and career development. The Rec Sports MSU Sailing Center is OPEN TO THE PUBLIC. 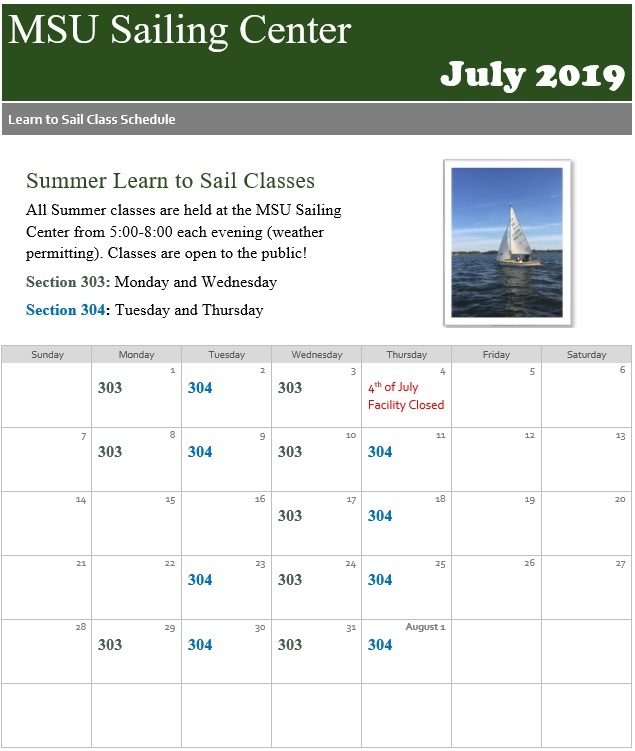 The MSU Sailing Center "Learn to Sail" program is open to all ages and will give each participant a solid foundation to begin a lifetime of recreational sailing adventures. Each participant will be provided the opportunity to acquire and practice the skills needed to sail a small vessel in protected inland lake waters in mild to moderate weather conditions. Each Learn to Sail program section includes 24 hours of formal instruction. Each session will meet for 3 hours, twice a week for 4 weeks. Program participation will maximize your time spent on the water while instruction occurs both on shore, and on Lake Lansing. 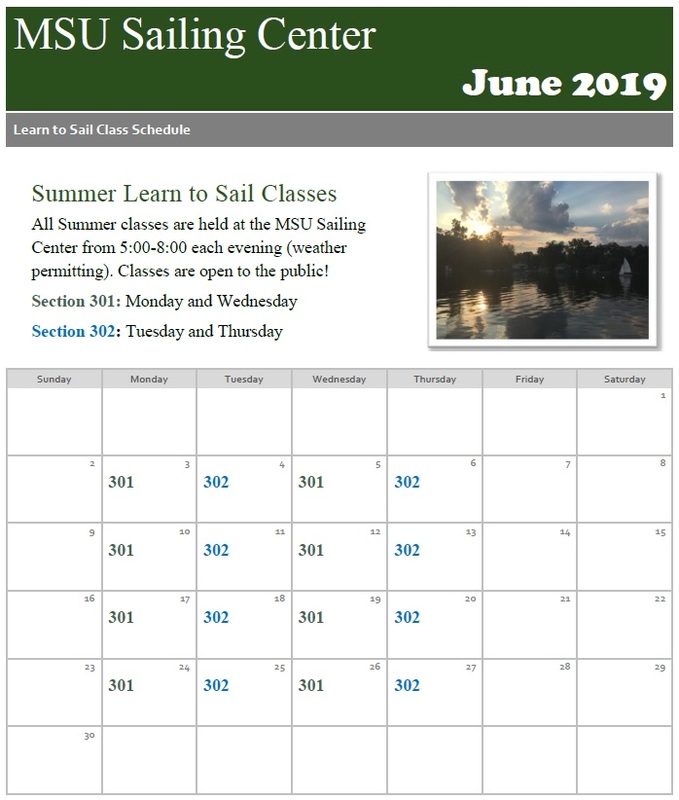 View the 2018 Learn to Sail class schedule. The MSU Sailing Center offers a wide variety of paddle sport activities, both structured and non-structured, on Lake Lansing. Including but not limited to canoeing, kayaking and stand up paddle (SUP) boarding. Use of MSU recreational paddle sport equipment is included in your MSU Sailing Center Membership. The MSU Sailing Center offers hourly rentals of our paddlecraft for use on Lake Lansing. Membership is not required and rentals are open to the public. For pricing information, visit our paddlecraft rental page by clicking here. Life Jackets (PFD's) will be provided by the MSU Sailing Center and are required to be properly worn at all times while on the water. Cushions, paddles, and Life Jackets (PFD's) are provided. The MSU Sailing Center is stoked to continue our partnership with Bounce Composite Boards with the addition of six more boards for the 2018 season! These boards are durable, stable, high performence, and made in the USA. They are great for learning, yoga, or taking a lap around the lake. We are carrying all three models. Check out more on their website at bouncesup.com. This is a soft paddleboard made almost like a bodyboard. This board is perfect for the whole family. It is designed to be very stable in the water. The MSU Sailing Center offers customized group programs including team building, experiential learning, fund raisers and leisure experiences for all ages. Group outings may include hands on sailing instruction, or just time spent on the water. More information can be acquired by contacting the MSU Sailing Center at (517) 339-8269. Please call the MSU Sailing Center (517) 339-8269 to arrange your unforgettable group outing on Lake Lansing. Private lessons are customized to meet the goals and needs of the participant(s) through one on one sessions with MSU Sailing Center staff. Each lesson will keep safety and accelerated productivity at the forefront. Multiple participants or group private lessons can be arranged based on your needs. *special pricing may be available. Phone the MSU Sailing Center at (517) 339-8269 to set up your personalized private lesson today! Experiential Education at the MSU Sailing Center incorporates "Place Based Learning" by utilizing our facilities and resources as a starting point to teach concepts in science, physics, math, history, environment, stewardship, sportsmanship, team/confidence building, technology, art and engineering. Experiential Education programs can be scheduled outside of normal operational hours. Please call the MSU Sailing Center at (517) 339-8269 for more information on Experiential Education.